It's been a hotly debated topic for a long time, but perhaps the latest initiative in the battle between cyclist and pedestrian will finally bring about some long-awaited (and desperately needed) change. 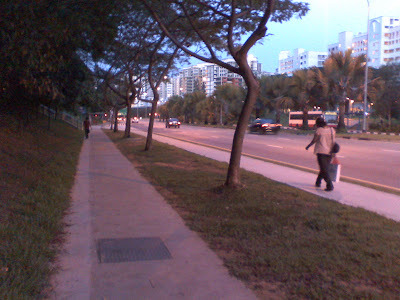 As I've written before, I once witnessed a young girl have two of her teeth knocked out after being hit by an errant bicycle rider speeding along the footpath on Woodlands Avenue 7, between Ave 6 and Drive 72. The offender at that time was more concerned with his broken cell phone which smashed on the ground upon impact, than with the well being of the bleeding little girl who had almost swallowed the bike bell (which he had been ringing with one hand while talking on his cell with the other). Since that time, there have been many, many other close calls, and enusing squabbles and arguments (sometimes even fisticuffs) over bike riders' rights and safety, and that of the pedestrian, young and old alike, has done nothing to rectify the problem. However, a few months ago, a secondary sidewalk was built on the northern side of Avenue 7, with some painting on the ground to indicate which path is for pedestrians only, and the one that is shared indicates for cyclists to slow down when approaching the stairs to HDB units. I thought this was a good start, but to date I have not noticed any improvements in habits or attitudes. Then just a couple of nights ago, new sign posts were erected. What a wonderful initiative - seriously - advising cyclists to give way to pedestrians, and even to dismount and push their bikes through the 'hot spots' outside the HDB apartments. The reason I am clapping with just one hand only, is that once again I have seen no change to behaviours... I still see cyclists speeding through crowds of pedestrians (on both paths), boldly and proudly ringing their bell to part the crowds - often without even slowing, many still talking on cell phones (this amazes me - how can someone riding at full velocity on a wet day, manage to ring a bell, talk on a phone, hold an umbrella, still think they can dodge the innocent people?). The pedestrians are quite often young children, infirm or elderly and sometimes oblivious to the danger - this saddens me. I will bring the other hand up for applause when the next step is undertaken... my suggestion is that people breaking the rules should be issued 'warning' tickets for the first few weeks until such time that they become accustomed to the new regulations and signage. Then after that, why not start handing out very stiff fines for the offenders? - it would not take long before people start taking the issue seriously. 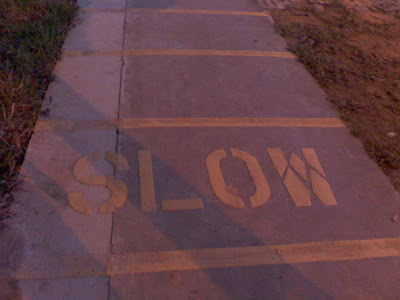 Unless action is taken to change behaviours, the investment in new pathways and widening of existing ones, along with the new signage and paintwork will just be a waste of money and time. Woodlands Avenue 7 is almost there - let's hope we have the opportunity to stand up and cheer the initiative!!! I totally argreed with you. We need licencing of cyclist. My estate Pasir Ris is no better. The cyclist are not even aware that it is against the law to cycle on the walkway. Yet they still act like the whole walkway belong to them. 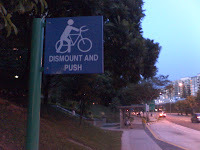 Pedestrians need to be aware of their surroundings too--I've been on rides on the bike path by Changi and had to yell at people walking in the bike road, despite ringing my bell for fifty meters before. That said, anyone who carries an umbrella and talks on their handphone while riding in the rain should do us all a favor by breaking their neck when they crash. 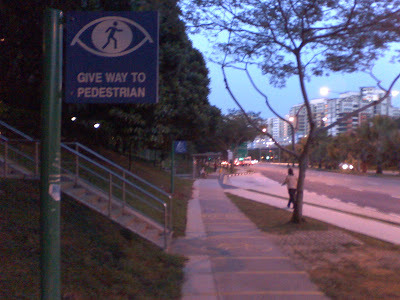 1) For pedestrians, especially those who are not that vulnerable, please exert your rights to use the pedestrian path by wisely not to respond to bicycle bell. Let them wait. 2) For cyclist, if you want to travel fast, use the road, don't use the bell. 3) For the authority, from the photos, I think it is much better to widen the road to create space for cyclists than to create an additional path for sharing. As a cyclist, I can say that while it's definitely possible to use the road, it's generally terrifying. I joke to my friends that I double the exercise I get just from the extra heart rate from nearly getting sideswiped twice a minute. If the government has any interest in encouraging biking, it really needs to do something to make it safer. Surely, no one is safe on the road. I have been commuting mainly by bicycle since 1996. There are some roads that are especially dangerous, while most are quite OK. I would consider Woodlands Ave 7 is quite suitable for cycling though I last cycle there more than 5 years ago when I used to ride to JB. There are many ways to reduce the terrifying feeling/level. Driving experience is very important. A rear mirror and the proper skill to use it. Good cycling skill, e.g. can easily and comfortably ride within the two yellow lines for 90% of the time. Until now, I personally don't like the direction the government seems to be going, which is trying to prevent cyclists from crowding the roads. I don't feel that they are encouraging cycling as a way to commute. Yeah, I don't get it. I thought the gov't hated cars--you'd think they'd be eager to see more cyclists. FWIW, I have a mirror, and it definitely helps. My current technique is use the bus lane whenever possible, and always demand a full lane from traffic whenever it's remotely feasible. (I mostly ride a short commute from city center to Little India.) The only time I ride on the pavement by preference is on a long-distance ride where I use roads that are clearly car-only (i.e. not even meant for pedestrians on the pavement)--riding over to MacRitchie or down to Sentosa are good examples. There's just no safe way to share the road with 90 km/h traffic. Thanks to all of you for your candid comments. I think one thing that is common in the responses, is that whether you're a cyclist or pedestrian, something more really needs to be done to make Singapore safer for all. Here's to safe walking and riding - Cheers!!! Maybe they will understand the regulation better if it was stuck to the end of a cricket bat, traveling at 60kmh, in the general direction of their faces. I am a cyclist and yes I am sensitive enough to know that pedestrians don't really like to have cyclists using the same walkway. It's a hypocrisy in their part. 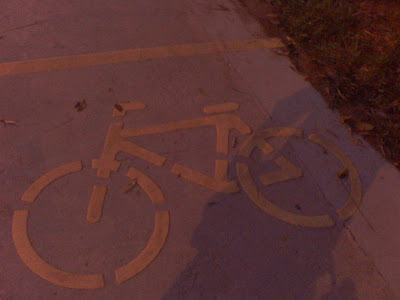 I'm sure they as cyclists would also cycle on the same walkway as well. I usually don't ring the bell (as it can be quite rude) but I think pedestrians themselves also need to realise that cycling paths are meant for cyclists. 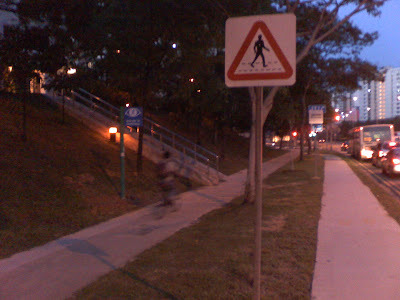 Many times when I cycle and wanted to keep to the proper path, I had to cycle on the footpath instead because a WALKER just had to walk at the cycling area. Aussie Pete has come a long way in arrogance, in saying that he has bells in his baby's pram to taunt cyclists that walkways, pavements, pedestrians, etc.... should be for him and his babies exclusive use. Is Aussie Pete ingraining a road hog culture to his babies?